It is a back-to-back win for the overseas Filipinos in Taiwan with The Filipino Channel (TFC) bringing not only an all-star basketball team lineup but also a world-class half-time break performance from no less than Maja Salvador, at the upcoming "Kapamilya Playoffs in Taiwan" happening on November 18 at the Fengyuan District Stadium, Taichung, Taiwan. The "Kapamilya Playoffs in Taiwan" event will be kicked off by the game between the champions from the RJD Basketball League and in the Tai-Phil Basketball League. Be updated on which team from the RJD Basketball League and in the Tai-Phil Basketball League will be part of the "Kapamilya Playoffs in Taiwan" and face-off with the Star Magic team. Catch TFC's weekly playoffs updates via TFC Online (www.TFC.tv). This is FREE for all, simply register on the site to watch the weekly updates. Do not be left behind, witness the exciting game between the overseas Filipino team and the Star Magic team, and be dazzled by Maja Salvador's smooth dance moves at the "Kapamilya Playoffs in Taiwan" happening on November 18 at the Fengyuan District Stadium, Taichung, Taiwan. 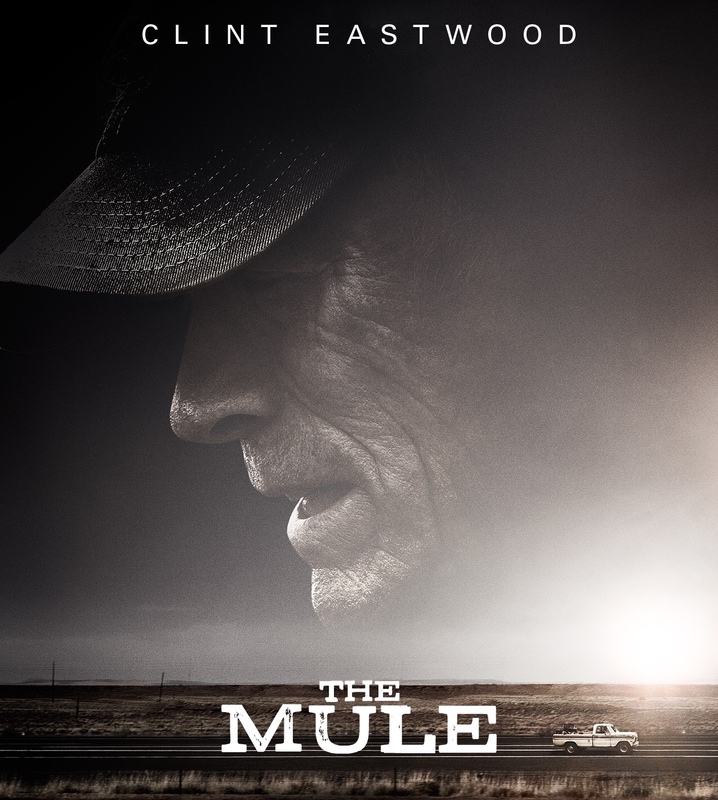 Warner Bros. Pictures has just unveiled the first poster artwork of Clint Eastwood's newest feature film, the drama "The Mule." Check out the poster below and watch "The Mule" in Philippine cinemas January 30, 2019. 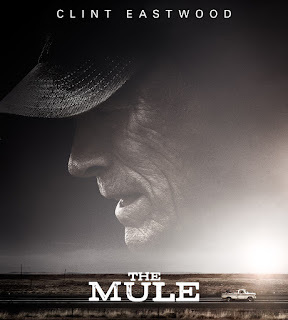 "The Mule" is distributed in the Philippines by Warner Bros. Pictures, a WarnerMedia Company. The deal gave JKN Global the right to distribute six titles, which are "La Luna Sangre," "Magpahanggang Wakas," "The Promise of Forever," "Till I Met You," Miss Universe 2015 Pia Wurtzbach's lifestyle travel show "Pia's Postcards", and the longest-running primetime series on TV, "FPJ's Ang Probinsyano." 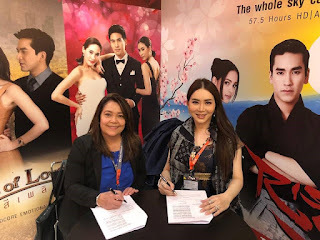 ABS-CBN shows like "Got To Believe", "The Legal Wife", and "Bridges of Love" have already aired in Thailand and were well received by Thai viewers. The shows have become so popular that Kapamilya stars, Jericho Rosales, Maja Salvador, Kathryn Bernardo, and Daniel Padilla were invited to the biggest media event in Thailand last July, the JKN Diamond Blue Mega Showcase, an annual trade event of JKN Global. 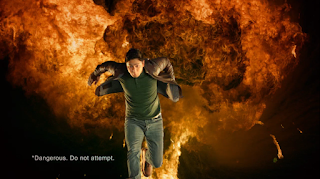 ABS-CBN's content, popular for its heartfelt Filipino stories, is made available across other territories through ABS-CBN International Distribution, recognized in the global arena as a reliable foreign content provider. It has been a premier source of high quality Filipino programming in over 50 territories all over the world and has sold over 40,000 hours of content worldwide. 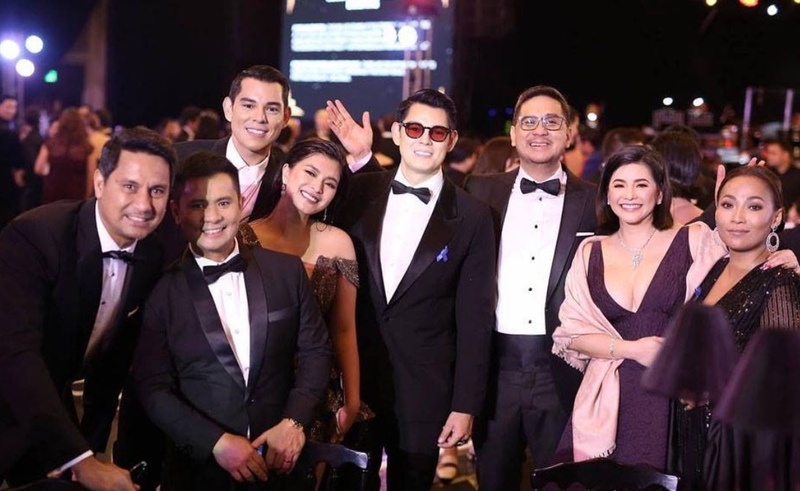 Living up to this recognition, ABS-CBN International Distribution commits to add to its line-up of high-caliber programs and movies with cast and storylines that appeal to various cultures. 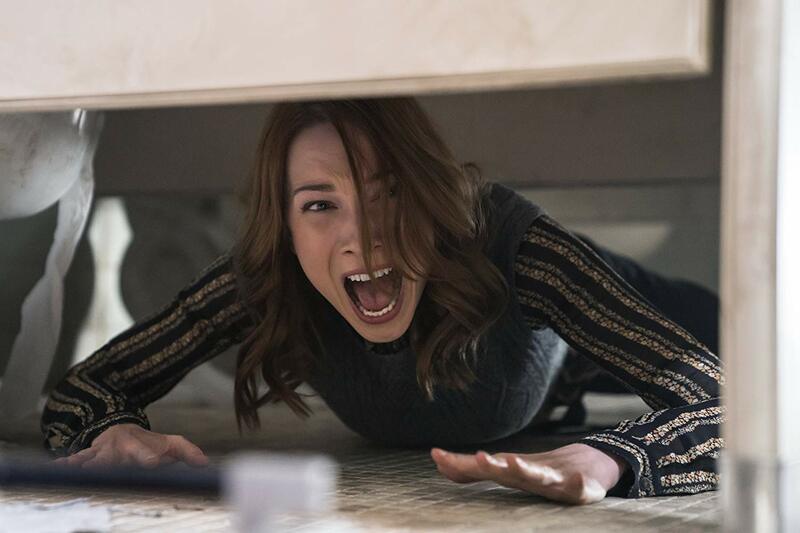 ABS-CBN is bringing "The Hows of Us," the highest-grossing Philippine film to date with gross earnings of P810 million, to the international content market, MIPCOM, in Cannes, France. The movie stars Kathryn Bernardo and Daniel Padilla, touted as the country's box office king and queen, as a couple who must figure out how to save their long-term relationship as each of them starts taking different paths in life. Also in ABS-CBN's showcase lineup are the romance-drama series "Ngayon at Kailanman," which is based on classic telenovela stories of star-crossed lovers from different worlds who must fight the odds to be together; "Halik," which shows the complications and intricacies that arise when old love intertwines with the new; and "Araw Gabi," a love story mixed with mystery and suspense that takes place on the paradise-like island of El Paraiso. 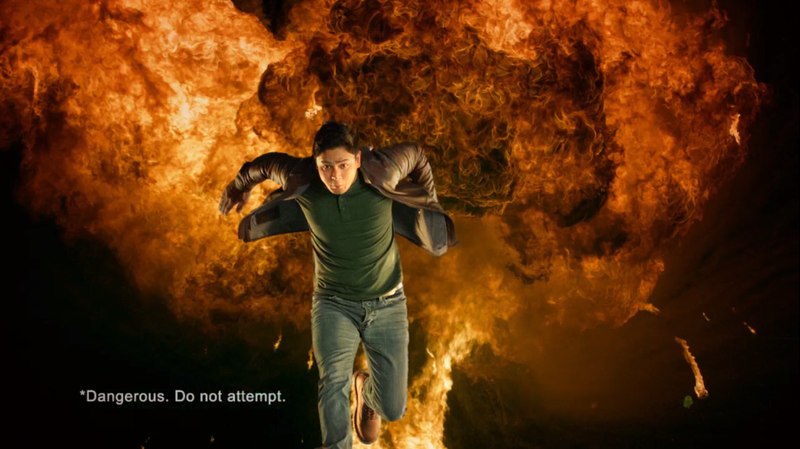 ABS-CBN's content, popular for their heartfelt Filipino stories, are available across other territories through ABS-CBN International Distribution, recognized in the global arena as a reliable foreign content provider. It has been a premier source of high quality Filipino programming in over 50 territories all over the world and has sold over 40,000 hours of content worldwide. Living up to this recognition, ABS-CBN International Distribution commits to add to its line-up of high-caliber programs and movies with cast and storylines that appeal to various cultures. 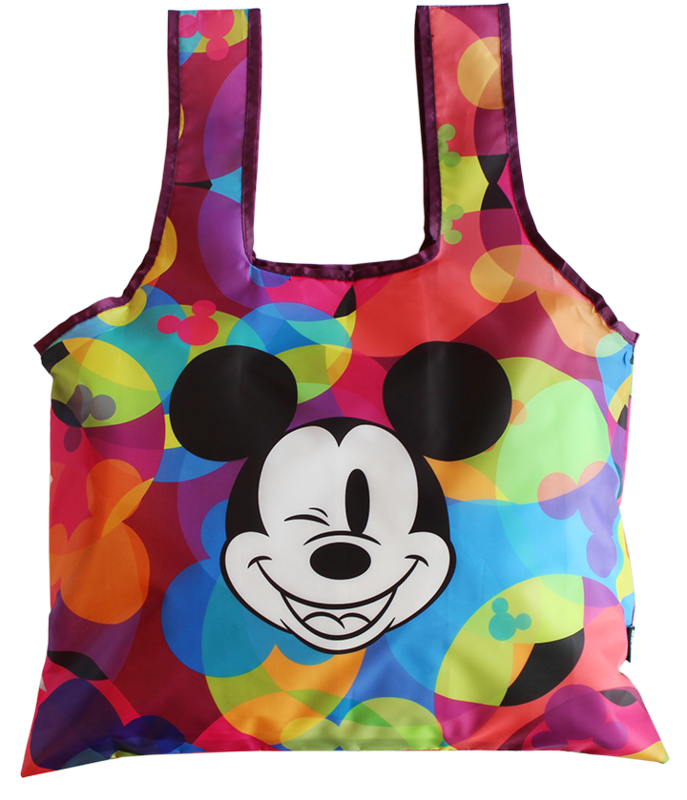 Visit its website http://internationalsales.abs-cbn.com. And all of these are set in a Mang Inasal store's kitchen, where the real action really happens - flames and flavors combine to create the ultimatenuot sa ihaw sarap of the country's most-loved chicken inasal. 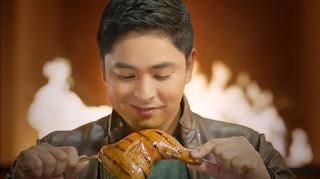 Mang Inasal Marketing Head Aileen Natividad said the latest Mang Inasal TVC reflects the exciting experience of customers whenever they savor Mang Inasal Chicken Inasal's "exploding flavors." "Our new TVC showcases our Chicken Inasal's explosion of flavors, because we grill it in such a way that our special marinade not just coats but permeates the entire chicken. 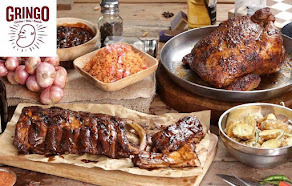 So whenever you have a bite of our Chicken Inasal, you will get thrilled with its perfectly grilled taste," she said. 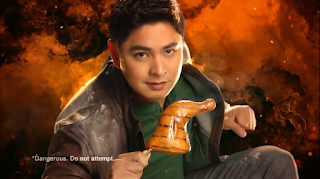 Mang Inasal's Chicken Inasal is prepared using a unique recipe, where choice cuts of guaranteed high-quality chicken are soaked in a special marinade made out of local secret spices, carefully skewered and grilled the Mang Inasal way. Further endearing Mang Inasal to Pinoys are the restaurant's homey, grillery ambiance and pioneering unlimited serving of rice for all itsPaborito meals. It also allows diners to savor the No.1 chicken inasal with special condiments, like chicken oil, which makes Mang Inasal meals even more flavorful. Mang Inasal opened its first store in Iloilo in December 2003, and has since then become one of the fastest growing restaurants in the country with over 500 outlets nationwide and counting. To know more about the leading Pinoy branded quick service restaurant, visit their website atwww.manginasal.com and like their Facebook pagewww.facebook.com/MangInasalPhilippines. Visit the nearest Mang Inasal store near you and get thrilled with the explosive flavors of the 2-in-1sa Laki, Nuot-sa-Ihaw Sarap Chicken Inasal! October marks Metro Society's birthday and gracing the illustrious anniversary cover is none other than Filipina supermodel making waves in NYC, Kelsey Merritt. In a Metro Society exclusive, Kelsey opens up about the magnificent moment that was: finding out that she was one of the 50 chosen to join the ranks of Naomi Campbell, Tyra Banks, Heidi Klum, Gisele Bündchen, and Adriana Lima in the upcoming Victoria's Secret show. Following the cover story is the main feature of Women Who Dare, the magazine's second one yet. Turn the page and learn the amazing journeys of Nika Diwa, Marga Nograles, Rosenthal Tee, Lynn Pinugu, and Mutya ng Pilipinas Miss Tourism International Aya Fernandez. Afterwards, discover the iconic French luxury furniture brand Roche Bobois as the iconic Mah Jong sofa interacts with the artistry of 10 creative Filipinos, resulting in splendid visions, in "Interactions." The Metro teams visited the artists in each of their spaces to see the making of and the very inspirations behind their interpretations of the icon. Then, go inside the studio of Wynn Wynn Ong as she gives a preview of what is to come in the magazine's upcoming event with her—the KaLIKHAsan Ball at the Metropolitan Museum this November. For wellness and beauty, discover a masterpiece in La Prairie Skin Caviar Luxe Cream and get long and lean with one-on-one sessions at Options Pilates Studio. Then, get to know Rach Sayed and Kimi Martinez of SSI, as they rep their luxury fashion brands and show off a few of their favorite things. Roman poet Horace popularized the philosophical phrase carpe diem which means "seize the day." This is similar to YOLO, "you only live once," of today's younger generation. Seize the day. This is the core message of the Aga Muchlach-Bea Alonzo starrer "First Love," directed by Paul Soriano and produced by TEN17, ABS-CBN Films Star Cinema, and VIVA Films. First Love inspires everyone to live each moment in our lives even in those darkest moments. Everything in the life of businessman Nick(Muhlach) is well-thought of and calculated until he crosses paths with the impulsive and optimistic photographer Ali (Alonzo). Both spending their lives now overseas, Nick is trying to find closure from his past mistake, while Ali is hopeful that a new life is ahead of her despite her congenital heart disease and the agony of waiting for a donor for a heart transplant. As Ali challenges Nick to seize every moment in his life before it is too late, Nick takes a risk by giving Ali another chance at life, even if it may cost someone else's life and potentially end their blossoming romance. Asked about the lessons they learned from the film, Alonzo talked about not thinking twice when love comes knocking in your life. "Do not overthink it. Go ahead and just love, because there might not be a next time. 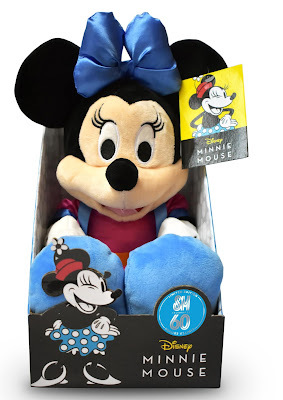 When love comes knocking on your door, just open your heart and welcome it," she explained. On the other hand, Muhlach talked about giving love despite all the pains in life "Just love, don't be pessimistic, don't doubt--just love. If at some point you get hurt, just hurt, it's okay, that's normal. Acknowledge that you are hurt then heal. If you do not acknowledge the hurt, healing will never begin," he said. Also part of the film are Edward Barber, Albie Casiño, and Sandy Andolong. 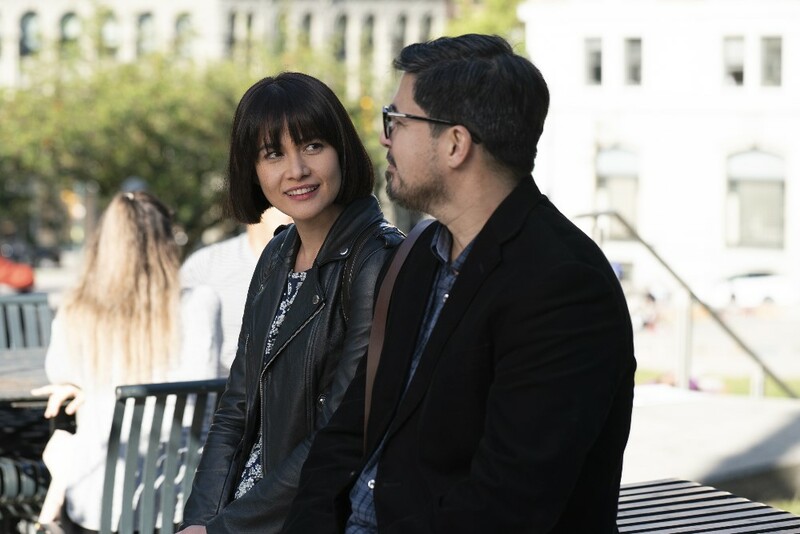 Seize the day with Aga Muhlach and Bea Alonzo, and enjoy the scenic city of Vancouver, Canada. Watch "First Love," to be screened via TFC at the Movies in the following regions on these dates: October 25 in the Middle East, Brunei, and Papua New Guinea; October 26 in U.S., Canada and Saipan; October 27 and 28 in West London, East London, and Staines, Surrey; October 27 in Frankfurt, Germany, Dublin and Cork in Ireland, Vienna, Austria, Paris, France and Copenhagen, Denmark; October 28 in Jylland, Denmark, Galway and Newbridge in Ireland, Machester, U.K., Milan, Italy, Kristansand, Norway and Malta; November 1in Australia and New Zealand; November 3 in Stavanger, Norway; November 3 and 4 in Thailand; and November 4 in Rome, Florence, Bologna, Messina, Torino, and Padova in Italy, Athens, Greece, Oslo and Bergen in Norway, Espoo, Finland, Stockholm, Sweden, and Madrid, Spain. For the cinema list in your region, visit usa.mytfc.com/firstlove, emea.kapamilya.com or the applicable TFC Facebook pages for your area. Connect with fellow global Kapamilyas and follow @KapamilyaTFC and KapamilyaGlobalPR on Twitter and Instagram. A Halloween treat awaits KBO viewers this weekend as it features the suspense and horror films of Kathryn Bernardo and Daniel Padilla, Ella Cruz, and Zanjoe Marudo this weekend. Airing for the first time is "Cry No Fear," which stars Ella and Donnalyn Bartolome. They portray half-sisters Kaycee and Wendy respectively, who don't like each other. One night as they are left alone in their house, a group of intruders breaks into their home and tries to kill them. They are left with no choice but to get along and plan their escape. Kathryn and Daniel's only horror film, "Pagpag," brings the story of a group of friends that stayed in a house of a woman who is currently mourning for her husband. During their stay in the house, each of them violates the 'rules' of Filipinos attending a funeral. Soon, a series of unfortunate events happens to them. Viewers will also get to watch "To Love Some Buddy" star Zanjoe Marudo in "Maria, Leonora, Teresa" as Julio, one of the parents whose child died in a field trip. To cope with their loss, their psychiatrist, Manolo (Cris Villanueva) gives them dolls. 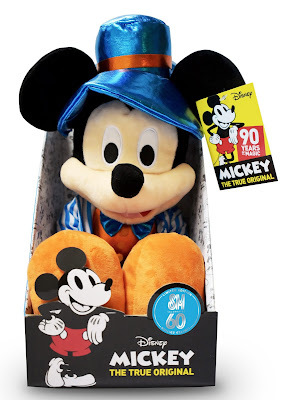 Little do they know that the toy they kept is controlled by a sinister master. Joining the line-up this Saturday (Oct. 27) and Sunday (Oct. 28) are Sue Ramirez's "The Debutants," and Pokwang's "Wang Fam." Simply register using any prepaid or postpaid SIM. For prepaid, just load up (Globe, TM, Smart, Sun, TNT) with P30; press the green / INFO button on your TVplus box remote to get your box ID; then text KBO30 OCT27 <TVplus box ID> to 2366. Since her early days in showbiz, Kapuso Primetime Queen Marian Rivera has been an icon of beauty and sophisticated grace. Her radiant glow, along with her dedication to her family and many advocacies, has earned her a rightful pedestal as one of the country’s top celebrities. Marian’s beauty is timeless. Classic. And her flawless skin has been taken care of by a brand she has stayed loyal to for over 10 years, Maxi-Peel. Her supporters who have watched her grow in the industry love her candor and authenticity - so much so that they’ve also supported every brand she chose to work with, knowing that she’d only endorse products she has a genuine regard for. Marian has been a long-standing partner of Maxi-Peel, ensuring that every campaign they release is more successful than their last one. Making its international premiere with a sparkling new production, Waitress opens in Manila on November 9th at the Carlos P. Romulo Auditorium, RCBC Plaza, Makati City. Set to play the sassy waitress and loveable friend, Becky, is none other than Bituin Escalante. An influential figure in OPM, Bituin has also made rounds in the theatre scene since 1999. Bituin has starred in numerous Tony-winning shows in roles such as Joanne in Rent, Effie White in Dreamgirls, and Asaka in Once on this Island. Her recent performance as Aling Saling in Himala:The Musical has earned her critical acclaim. Nino has been in the local music scene since the ‘90s, and has released several solo albums. 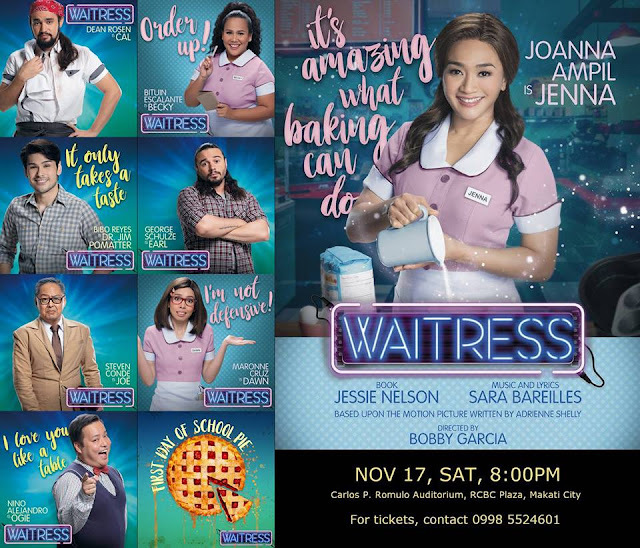 Waitress marks his fourth production with Atlantis, as he has previously appeared as Nick Massi in Jersey Boys, Ethan Gerard in The Full Monty, and Bud in The Bridges of Madison County. He also joined The Voice Philippines and made it to the top 3 with his powerful rock vocals and soulful ballads. Waitress marks George's and Dean’s debut with Atlantis Theatrical. George’s past productions include Hair, Beauty and the Beast, Monty Python’s Spamalot, Into The Woods, The Horse and His Boy; and 50 Shades! A Musical Parody. Dean previously appeared as Sir Galahad in Monty Python’s, and made his professional theater debut in A Peek Into The Woods. After making a killing with its $77.5 million No.1 debut in the US - the second-biggest opening ever for a horror film - Universal Pictures’ “Halloween” is set to slash its way to the Philippine box-office as it opens in selected cinemas Weds, October 24. Special edition Mickey Tote Bags: As a bonus, there are four exclusive tote bag designs up for grabs. 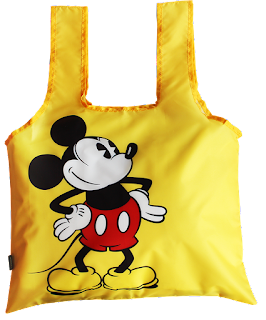 With a minimum purchase of P1,000 worth of Mickey Share-A-Smile, SM 60th merchandise, or Mickey Classic products comes with a Collectible Mickey Mouse Tote Bag with Zipper Pouch. Collect all four designs until October 31 at SM Character Shop, Children’s Wear, Boys - Teens Wear, and Toy Kingdom. We all wish that we find our One Great Love in this lifetime with whom we hope to spend the rest of our lives with. But are we willing to make the sacrifices and go through all the pain to attain it and keep it? 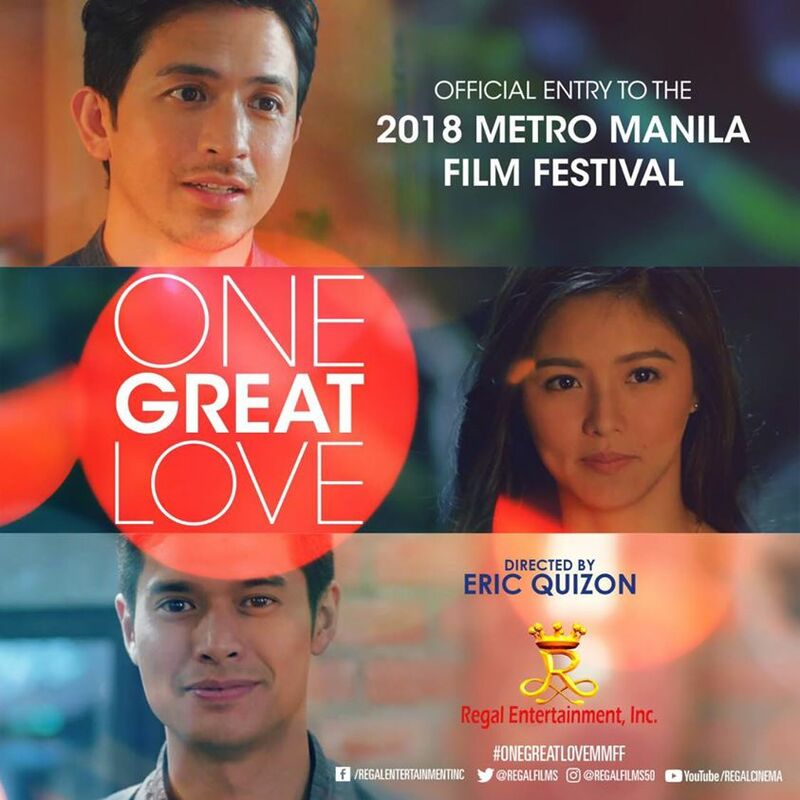 Top-billed by celebrity A-listers Dennis Trillo, JC de Vera, and Kim Chiu, the romance drama film, a hugot - bangon film that tackles a subject that everybody is highly familiar with and which we can all relate to: love and relationships. "Magagaling lahat dito umarte. Baka makakuha sila ng awards. Totoong magagaling. 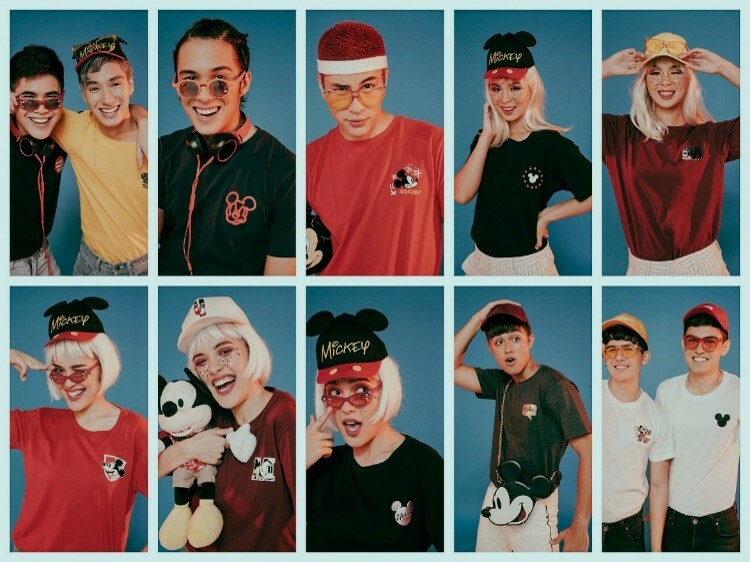 Maganda ang pelikula para sa pasko. One Great Movie to watch out for," says matriarch Mother Lily Monteverde. Paglisan" and "Never Tear Us Apart" runaway winners in this year's Cinema One Originals. 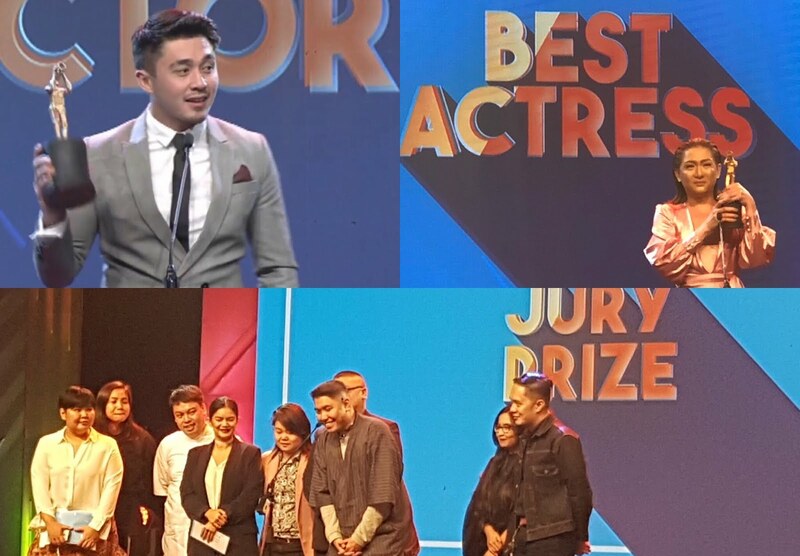 First time actress and stand up comedienne Iyah Mina bags Best Actress award while co-star Arron Villaflor gets Best Actor. 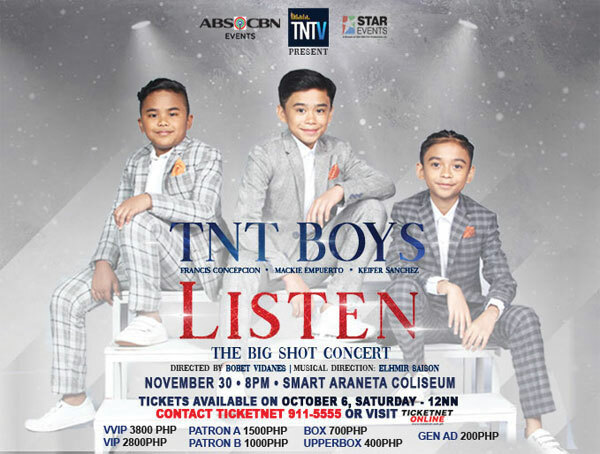 Only more than a year after Mackie Empuerto, Keifer Sanchez, and Francis Concepcion became officially known as the TNT Boys, the international sensation and bigshot trio will stage their first-ever major concert titled “Listen: The Big Shot Concert” at the Araneta Coliseum on November 30. The boys are busy preparing for the concert after their latest gig last weekend (October 14) at the President's Star Charity, a fund-raising charity event, where they sang for the president of Singapore, Halimah Yacob, the third head of state they have performed for after Pres. Rodrigo Duterte and Papua New Guinea prime minister Peter O' Neill. Known for their electrifying belting showdowns and impersonations of legendary music icons, the trio will feature powerhouse solo and group performances in their concert and sing a new repertoire of songs they have not performed in public before. Joining them are special guests Jed Madela, K Brosas, and fellow “Your Face Sounds Familiar Kids” performers Chun-sa Jung, Esang de Torres, Krystal Brimner, Marco Masa, Noel Comia Jr., Onyok Pineda, Sheena Belarmino, at Xia Vigor. Following their career milestones, the TNT Boys are giving back to the community as they recently donated their P50,000 cash prize from “The Kids’ Choice” to ABS-CBN Lingkod Kapamilya Foundation Inc.’s Bantay Bata 163 program. Initially known as grand finalists of “Tawag ng Tanghalan Kids,” Mackie, Keifer, and Francis shot to fame and were launched as the TNT Boys after their singing showdown on “Gandang Gabi Vice” in June 2017 went viral. This week, the boys are scheduled to fly to the US for an international talent competition. Tickets for “Listen: The Big Shot Concert” are priced at P3,800 for VVIP, P2,800 for VIP, P1,500 for Patron A, P1,000 for Patron B, P700 for Box, P400 for Upper Box, and P200 for General Admission. Visit ticketnet.com.ph or call (02) 911-5555 for more details. After the successful run of The Clash hosted by the Asia's Songbird Regine Velasquez-Alcasid. The Golden Voice from Cebu hailed as the Ultimate Clasher and she is Golden Cañedo. 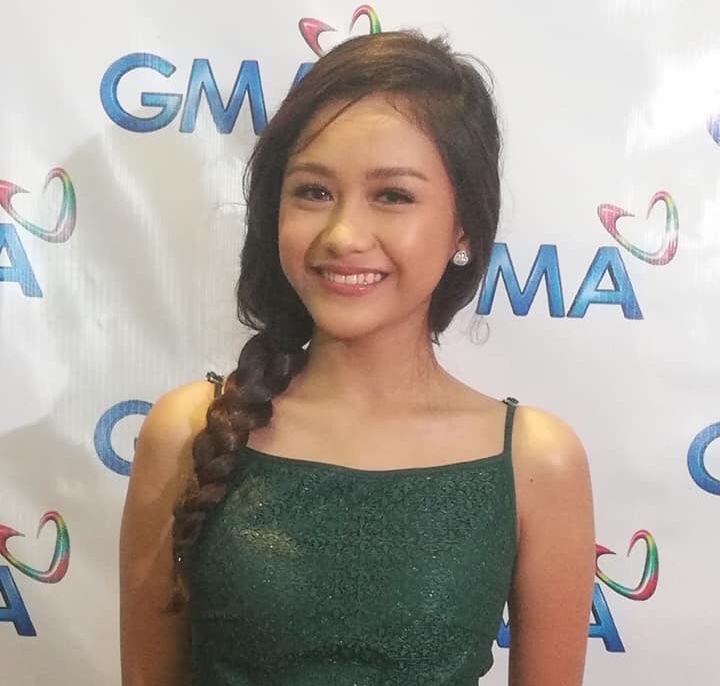 On October 11, Golden along with the 5 Clashers - Jong Madaliday, Garett Bolden, Anthony Rosaldo, Miriam Manalo and Josh Adornado signed an exclusive GMA Artist Center contract. GMA Executives Lilibeth Rasonable, Gigi Lara-Santiago and Simoun Ferrer are there to join the clashers. The Top 6 Clashers first project with GMA-7 is the Sunday Musical Variety Show "Studio 7". It will start airing starting October 14 at 7:40PM only at GMA Network. SKYBIZ, the business solutions arm of content and broadband provider SKY, continues to promote the use of digital tools for entrepreneurs for business growth opportunities as it launches the SKYBIZ fiber network in Iloilo and Bacolod via the SKYBIZ Growth Series on September 18 and September 20, respectively. SKYBIZ's Growth Series is dubbed as "Embracing Digital Success: Transforming the Future of Your Business" will teach company owners and decision makers the advantages and specific tools in digital marketing. Topics to be discussed are: Success in Digital Marketing and Benefits of Going Digital for Your Business: Traditional Marketing vs. Digital Marketing to be led by industry experts like Maven Solutions CEO Yen de Felipe; SCI – Satoshi Citadel Industries Co- founder/CEO John Bailon; AcudeenTechnologies, Inc. founder and CEO Mario Jordan Fetalino III; ServeHappy Jobs founder and CEO Audrey Tanco Uy; Mober, Move at a Click founder and CEO Dennis Ng; and Pushkart.ph – Online Grocery Delivery CEO Joshua Aragon. "Digital marketing benefits businesses of all sizes by giving access to the mass market at an affordable price. It allows truly personalized marketing. The main advantage of digital marketing is that a targeted audience can be reached in a cost-effective and measurable way. We want to enable our clients for the future," shared SKYBIZ Dicky Liwanag, SKYBIZ Enterprise and MSME head. Jed Madela normally celebrates his showbiz anniversary in style, and this year is no different as he marks his fifteenth year in the industry with his first-ever solo concert at the Araneta Coliseum with "Higher than High: the 15th Anniversary Concert" happening on November 16 (Friday) at 8 PM. "It has always been the dream of every artist to stand onstage and scream 'Good evening, Araneta!' I'm very excited and nervous at the same time. Excited that finally, I will be performing solo in the Big Dome and nervous because there's a lot of pressure on me now to fill its seats," he said. According to Jed, his manager thought of the concert's title. "She came up with it based on what audiences expect from me whenever I'm onstage - which is sing big songs that require me to belt to the heavens. . . . but more than me doing songs like that, my main goal as far as this concert is concerned is to take the audience to the next level." Jed and his team began conceptualizing the show early this year. 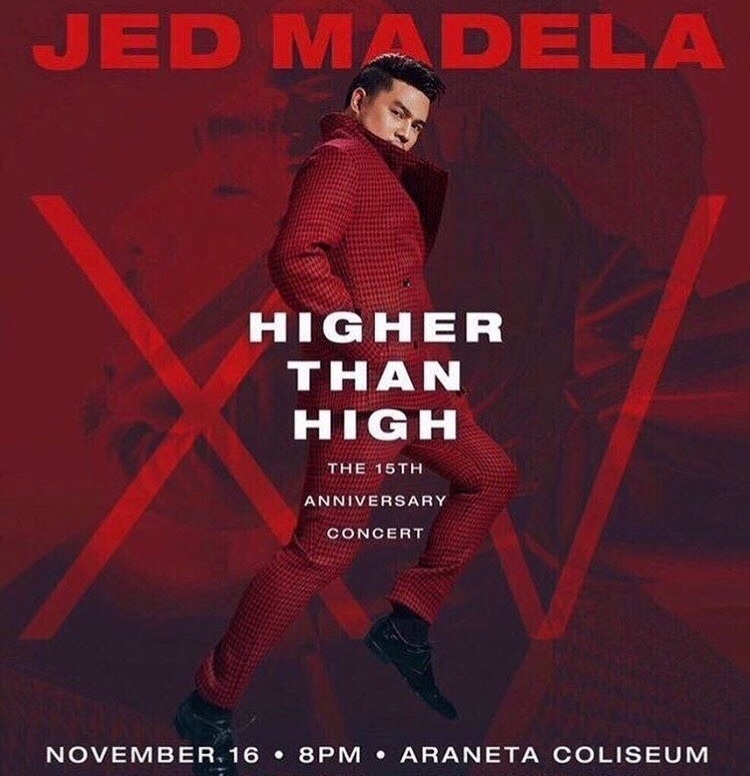 He is proud of the show and says they pulled out all the stops to ensure that "Higher than High: the 15th Anniversary Concert" will be one for the books. "We worked really hard on all the numbers, especially the opening," he shared. "I don't want to spoil the surprise, but I will say that the show starts the moment you step into the venue." Jed shared that the show is dedicated to those who have supported him and his dreams since the beginning - from the release of "I'll Be Around," his first album, to his star turn at the 2005 World Championships of Performing Arts, to his current status as one of OPM's greats. "I am so full of gratitude to everyone who has been with me since day one. The ones who never left me. I may not have a horde of screaming fans, but I know that I have supporters who quietly support me in their own little way. Knowing that I've touched their lives is enough for me. As long as there are people who are willing to listen to me sing, I will keep singing." "Higher than High: the 15th Anniversary Concert" is directed by Marvin Caldito. Jed is set to perform with the ABS-CBN Philharmonic Orchestra - under the baton of Maestro Gerard Salonga - and the Philippine Madrigal Singers. 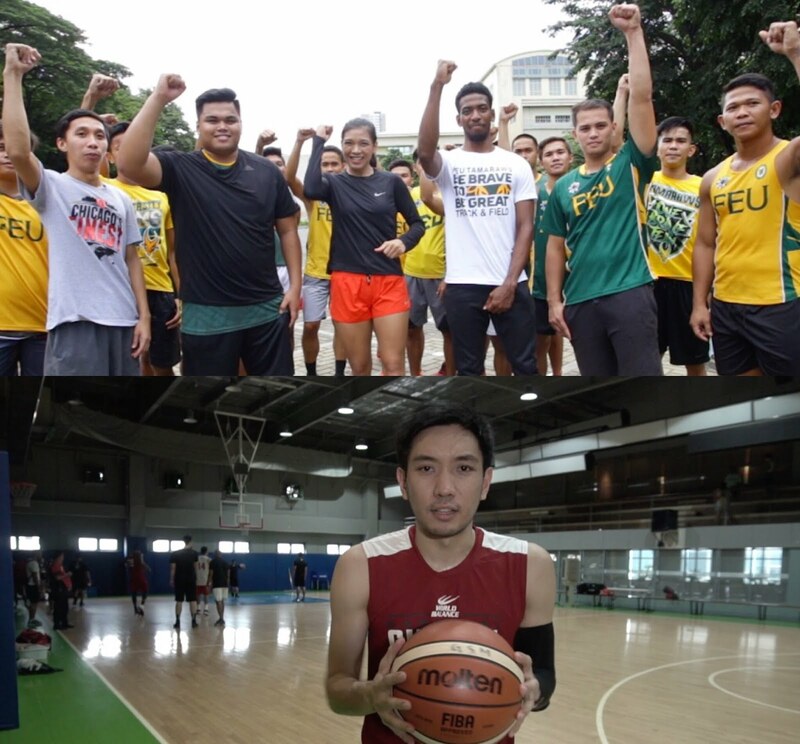 Basketball star Jeff Chan will pay tribute to his alma mater Far Eastern University (FEU) as the spotlight turns to the Morayta-based campus in "University Town" (U-Town) this Saturday, 1 pm on ABS-CBN S+A and S+A HD. Jeff was a star player in the FEU senior men's basketball team before making a name in the professional league and sniping for the national team. Gretchen Ho and Robi Domingo will join him as he reminisces his glory days in the team, which holds the record for most championships in UAAP senior men's basketball. Another former FEU student that's making the country proud is journalist Jamela Alindogan, who is currently a correspondent of an international media network in the Middle East. The former FEU courtside reporter has truly gone a long way and she will share how her education and experience in the UAAP has helped her build a career in journalism abroad. Meanwhile, volleyball superstar Alyssa Valdez will get to try another sport as she joins the training of the multi-decorated FEU Track and Field team. See if she can keep up with the speed and agility of the rampaging Tamaraws in the field of athletics. Also get a tour of FEU campus, known as the "oasis of U-belt" with its green and relaxing landscape, and meet the students behind the award-winning film "Fat You," which follows the story of a girl suffering from discrimination because of her weight. Don't miss another fun and inspiring episode of "U-Town" with Gretchen Ho, Robi Domingo, and Alyssa Valdez this Saturday (September 29) at 1 pm on S+A and S+A HD. For sports news, visit sports.abs-cbn.com or follow @ABSCBNSports on Facebook and Twitter. For updates, follow @ABSCBNPR on Facebook, Twitter, and Instagram, or visitwww.abscbnpr.com. Two-time Oscar-nominee Ryan Gosling stars as real-life astronaut Neil Armstrong in Universal Pictures' First Man, the riveting story behind the first manned mission to the moon, focusing on Neil Armstrong and the decade leading to the historic Apollo 11 flight. 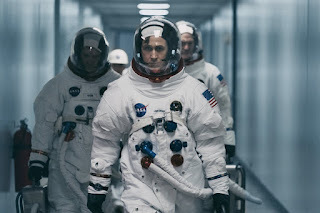 In First Man, Gosling proves his dedication in time spent studying to portray the global icon. For the production team, director and star are inextricably linked in their shared passion for perfection. 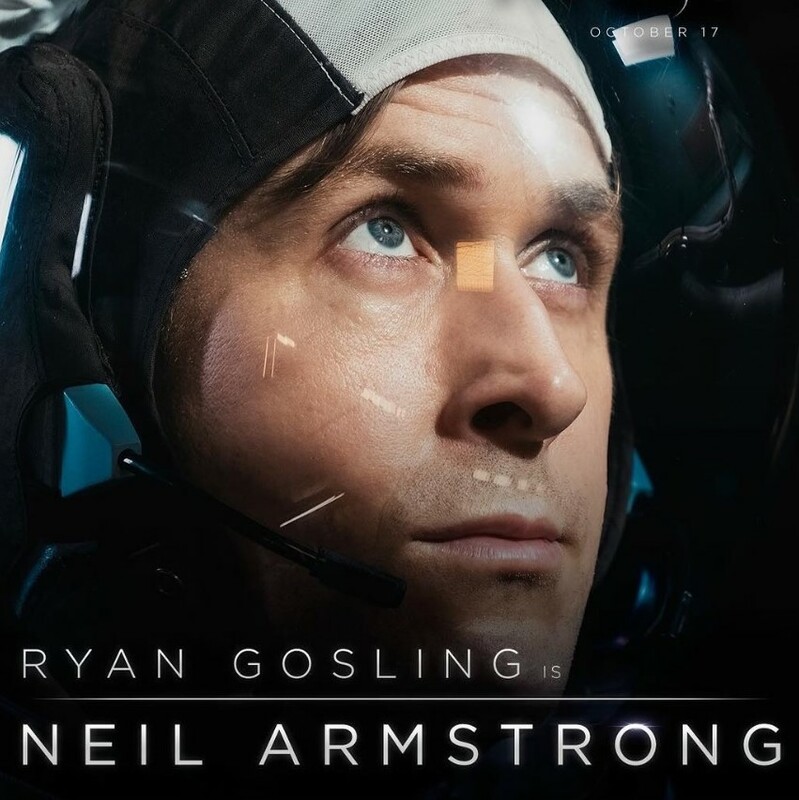 "Ryan has a commitment to doing excellent work," sums producer Marty Bowen. 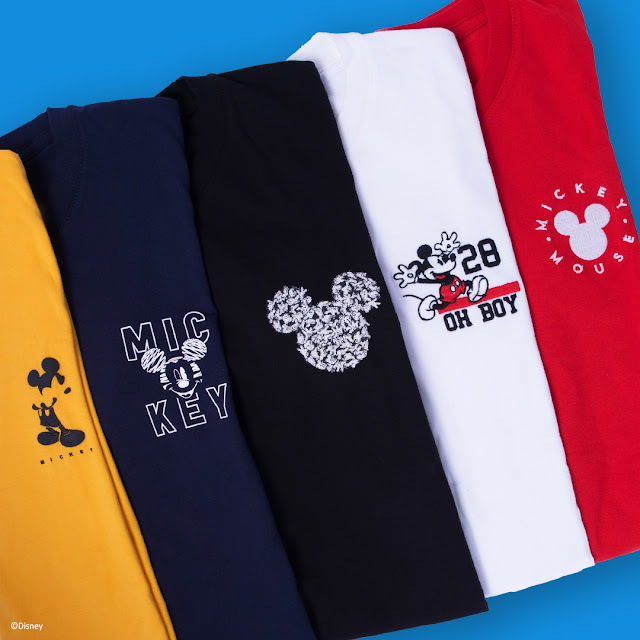 "He is keenly aware of the legacy he's leaving behind and often, likeminded people find one another in material that they can connect with. It makes sense that Ryan and director Damien Chazelle want to work together. When you watch La La Land, the character that Ryan plays is someone who's obsessive about his craft…because Ryan's obsessive about his craft."